Thank you to my coach Frank for letting me fill in for today's race--the Atlanta Pride 5K, celebrating its 25th Anniversary! GOAL #1: To not finish DFL (Dead Effin Last). *GOAL #4: Use this race as prep for the 4th of July Peachtree Road Race! Last year, when I ran this 5K at Piedmont, I came in (you guessed it) DFL* (for those of you who don't know, it's the acronym for DEAD LAST. With a more colorful word in between). What did I expect? I was running against hundreds of really fit gay men and women. But there were also people with dogs and strollers, and senior citizens, who gayly sauntered past me. That race was still pretty early in my running "career"--having started in Jan. 2014. It was also the first race I had signed up without Frank, but my Weight Watchers buddies Susan B. and Dustin D. were there, having encouraged me to join. When I arrived, I was smitten by the rainbow balloon start and finish--what an uplifting way to start a race with a burst of brilliant color! Happy 25th Anniversary, Atlanta Pride 5K! Unfortunately, that burst did not translate into speed in June 2014. As I huffed and puffed my way through the park, first the mobs of athletic people left me in their wake, then the people toting babies (fur and otherwise). The last mile, as I was making my way up the first of three steep inclines from the meadow, a kindly volunteer walked with me for a few hundred yards. He reminded me that it wasn't how I placed--it was the fact that I was THERE, and I would beat every single couch potato that didn't wake up that morning. I had to console myself with that thought as I struggled up the last hill, walking and trying not to feel disappointed in myself as I inched towards the bitter end. Yet in the last few hundred yards, several more volunteers and fellow runners cheered me on. I was touched. I vowed I would return, and hopefully have a better showing next year. So that led up to this. Since Frank ran his first Peachtree Road Race last year, I made up my mind I would do it too. 10K seemed a little intimidating at first, but as I began to rack up the training miles at Stone Mountain and the Beltline, I have worked my way to running 5 miles pretty regularly, and slowly whittling my times down. But all was not lost. When I looked at the final time, not only had I beat last year's Memorial Day 5K by nearly 5 minutes, but I had actually beat Frank on chip time by a minute! It gave me heart and hope. Which brings us back to the race today. I think Frank sensed my disappointment in losing to him, because a few weeks ago, he graciously proposed that he would coach me, using the Galloway method. Furthermore, he would also sign up for the Atlanta Pride 5K, run the whole way with me, and at the end, he would push me ahead, thus ensuring I was not DFL. So the training for #NotDFL began. Three weeks ago, we began running the race route at Piedmont Park, using run/walk splits. I know Frank had been religiously using this training method, which he'd learned from his running classes and fellow athletes. However, I'd been mentally reluctant to try it, thinking hesitantly that if I stopped to walk, I might not be able to start up again so quickly, and surely, I'd be slower than the continuous slow jog gait I've achieved. Not so. The theory behind the Galloway method is sound--when you stop to walk, you lower your heartrate, even if only for a minute. That way, when you re-start running, you are able to take on a burst of speed that you were not able to achieve if you just try to run the whole way. So with Frank and his timer, we began my training early on a Saturday morning three weeks ago. I'm not gonna lie, the first mile was hard, especially because the Pride route starts on an uphill climb. But... by the time I hit my second mile, the minute splits were getting easier. Sure enough, as Frank promised, when I finished that first training run, I had run mostly 17+ minute miles, faster than my regular 18-19 minute pace. The training time alone blew away my last year's result by several minutes! During the next couple of weeks, I ran a full 10K/6.2 miles around Stone Mountain using the Galloway method--again success! While the last mile was hard, it gave me confidence that I will definitely finish the Peachtree. For last Saturday's training run, Coach Frank suggested we try a 30 second split, because he noticed that my run pace is fastest right after I finish my walk split. By increasing the frequency, perhaps my overall pace would be faster. I was a little dubious that 30 seconds would make a difference, and overall, while it didn't improve my time by much, I felt stronger with my cardio endurance. It's a Rainbow kind of day! Which brings us back to today. Race Day. On the way to the park, I discussed with Frank that I wanted to try splits of 1 minute run/30 second walk, to see if it would improve my time. I also asked him to serve as my timer, because I wanted to listen to energizing music along the way. Coach Frank agreed and he would use hand signals. We were meeting up with Susan and Dustin again, #TeamWeightWatchers, and my battle cry was #NotDFL. I happily snapped photos of the rainbow balloon finish, and when I look at the photos, I can tell I look so much more fit. Although this was the 25th Anniversary of the race, the field of runners was definitely smaller than last year. And no babies and dogs! Rut roh, that would make it more competitive. To my surprise, I ran into David J.--a friend from my f*ghag days. He'd taken up running years before, and it was great to see him. He said he'd been watching my progress on Facebook, and was happy to run into me! The colorful crowd was milling around. I wasn't sure whether they would start on time, because last year, there was quite a delay. All of us were concerned about the heat (it's been hitting 90+ degrees lately), but we were rewarded by cool breezes--a good sign! Before we knew it, and with little warning, BANG, the gunshot went off right on time at 8 am! Drone view of the start - we're off! The first hill went fast--I definitely felt the adrenaline rush of the start, and with Frank pacing me, I was out with a surge. Sure enough, the first mile was one of the fastest race splits I had--16:25! As we were rounding out to the 2nd hill, I was so in tune to the music, that Frank had to motion to me that there was someone behind me calling my name. I pulled out one of my headphone buds, and to my true surprise, there was Kimberly Krautter! Kimberly, in her yellow tutu, is someone I've become good friends with on Facebook, although we'd only met one time in person. We both share liberal interest, and a love of goofy/cute pet videos, and we follow each other avidly. What a great way to meet up with her unexpectedly! Kimberly had a "caboose" of two friends with her, and as we said our goodbyes, they pulled on up ahead. Those girls are fast walkers! Back to concentrating on the race. In mile 2, there is a nice downhill section, and I could feel my legs loosening up and breathing easier. However, it was also getting warmer, and despite Frank pacing me, I knew that I was slowing down. Rounding the meadow, we were starting again up the 3 sets of hills before the end. I could feel my legs getting heavier, and I know Frank was probably giving me some shorter splits. I did notice, however, that when I switched to walking, I appeared to be faster than when I was at a slow jog--something to remember for the Peachtree. Thinking I had to make up a bit of time though, I kept running a few splits longer, rather than slowing to walk. On the final hill, I thought to myself, I'm in such better shape than I was last year--breathing easier, and running with my head up, legs pumping. However, there was an older gentleman who had been walking right behind us most of the way, and he passed us on this hill. I was worried--I hadn't seen many people behind us. There was Kimberly's trio ahead, and also a male couple, holding hands. With this gentleman passing me, I thought, oh no, I can't be DFL, I just can't! Frank was motioning to me. He was signaling that I really should at least pass this guy before the end. We were already on the downhill stretch and I kept running well past my split. But rounding the final corner to the level surface end stretch, Frank motioned me to walk. I remembered his advice that I had to slow it down just a little bit, so I could reserve the last bit of strength to sprint the last few dozen yards. I followed my coach. We could see the finish line in sight! The older man was only a few feet ahead, and Frank, like he was flashing a NASCAR flag, motioned me to go, Go, GO! I gritted my teeth. This was it--AS GOD AS MY WITNESS, I WOULD NOT BE DFL! So I took off. I don't know quite how I managed that final burst of speed, because my heart was really pounding. As I lowered my head and propelled myself forward, I know I left it all on the table--I passed the man, and then, shockingly, the gay couple who were sauntering through the final yards! I don't think they saw me, the crazy woman in pink, taking a final stab at glory as I blazed past them at the finish line! I could hear Frank's voice in my head--"Bonnie, RUN FOR YOUR LIFE!!" Success!! #NotDFL -- 5 minutes faster than last year! After I stepped across the final threshold, I had the faint feeling that I might throw up. Arteries might explode. Was I breathing? Why was there not enough air? And there was Frank--jogging up to congratulate me. While I couldn't talk, he was praising me on my strong finish--smoking past three competitors and pushing the pedal to the metal at the end! #TeamWeightWatchers and Kimberly were all there as I hobbled round, catching my breath. It is such a good feeling to finish in the company of friends. As we were walking back to the parking deck, an older woman stopped me, to say, "You did a great job out there!" It feels awesome to get a compliment from a stranger. And as we almost got to the car, Berlinda Wall herself, the giant drag queen who announced the winners, called out to me, "Hey! Woman in pink!" I turned around, and she greeted me. She said she remembered me from last year, and what a great finish I had! She was a towering vision of flamingo pink and feathers, and she was fabulous! Of course, I had to stop for a photo :). GOAL #1: To not finish DFL (Dead Effin Last): ACHIEVED! My final time was 56:44, almost 5 minutes faster that last year's time of 1:01:27! GOAL #3: To run in honor of my LGBTQ friends--Joe T., Craig C., Paden S., Lee A., Susan B., Dustin D., Paul A., and so many more, and in the hope for the Supreme Court ruling for Marriage Equality for all by the end of this summer. ACHIEVED, and hopefully SOON TO BE ACHIEVED! *GOAL #4: Use this race as prep for the 4th of July Peachtree Road Race! ACHIEVED! Congratulations! 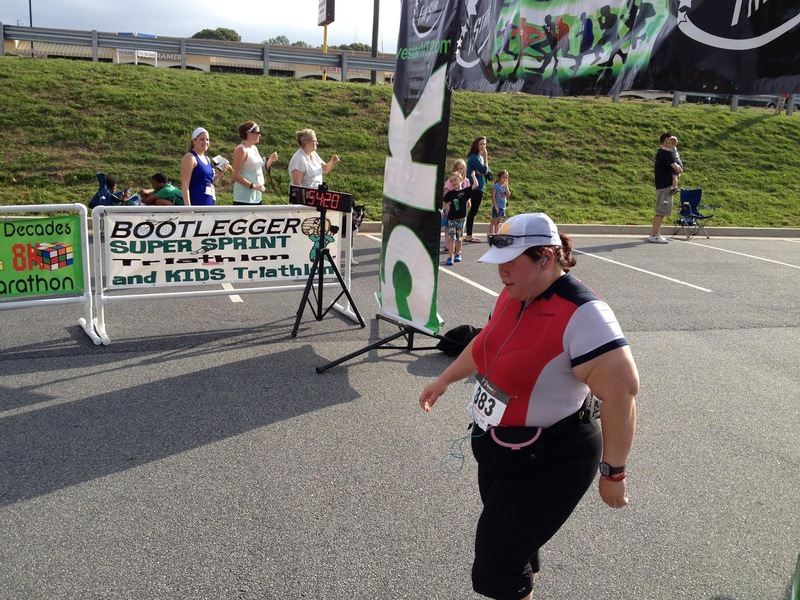 This is one of the most heartwarming posts on running I've read in a long time!